Gunshot residue found in a car belonging to a man accused of murder "does not assist or address" whether it was used by a gunman, a court heard. Forensic scientist Angela Shaw said three gunshot residue "particles" found in Andrew Everson's Peugeot 309 could have been "found in the environment or picked up unknowingly". 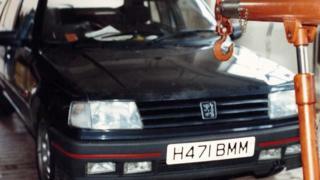 Mr Everson denies murdering David Watkins on 14 January 1993. He was acquitted in 1994, but is on trial again due to "fresh evidence". Prosecutors said further scientific tests revealed new evidence suggesting Mr Watkins "must have been" in Mr Everson's car hours before his death, a point the defendant had denied in 1993. Mr Watkins, a 30-year-old cannabis dealer, was shot in the back of the head in an "execution" style murder in Searles Farm Lane, near Reading on 14 January 1993, jurors were told. Prosecutor John Price QC said "small but detectable" gunshot residues were found in vacuum samples of Mr Everson's vehicle. But forensic scientist Ms Shaw, a witness for the defence, said: "Three particles of type four [gunshot residue] found in the vehicle, does not assist or address whether or not the vehicle was used by the shooter to drive away from the scene." She added the "low level" of gunshot particles meant "very little" could be interpreted, "given particles can be found in the environment...or it can be picked up unknowingly". Ms Shaw said: "The vehicle has been exposed to a sort of gunshot residue but it's not possible to say how or when that took place. "The vehicle was not seized until 10 days after the incident and it's unlikely residue would remain for this time if the vehicle had been used." The weapon used to kill Mr Watkins was never found, the court heard. The trial at Reading Crown Court continues.